The Great Feast of the Transfiguration of our Lord is one of the really important feasts in the Orthodox Church, but it is either barely noticed or even totally ignored in Western Christian faith communities. In fact, this glorious feast is the basis for many of the most significant characteristics of Eastern Orthodox Christianity, that set it apart from Western Christianity. This feast is so important for Orthodoxy precisely because it forms the foundation for much of Orthodox theology and spirituality. As it is with each of the major feast days of the liturgical year, there are two aspects of each feast. There is the outward and historical aspect, and there is the inner, spiritual and theological meaning and significance of the feast, and its influence on the rest of Christian theology. Much has been written about the former — the outer and biblical accounts and experience of the Transfiguration; we will focus our attention on the latter — the inner, spiritual and theological meaning and significance of the Transfiguration. ■ the theology of who Jesus the Christ is. Obviously, this involves many central elements of the Christian Faith. It is precisely because the Transfiguration is so important in Orthodoxy that explains why the Orthodox views about all the above aspects of theology differ enormously from Roman Catholic and Protestant conclusions about these same theological issues. Indeed, a whole book could easily be written to adequately explore these topics in depth, but here, we will present just a brief overview. The basic principle of authentic Orthodox icons is to portray visibly the transfigured invisible world of spiritual reality. Icons depict the events of salvation history and its saints, not as seen with the outward, physical eyes, but as seen with the inner, spiritual eyes. 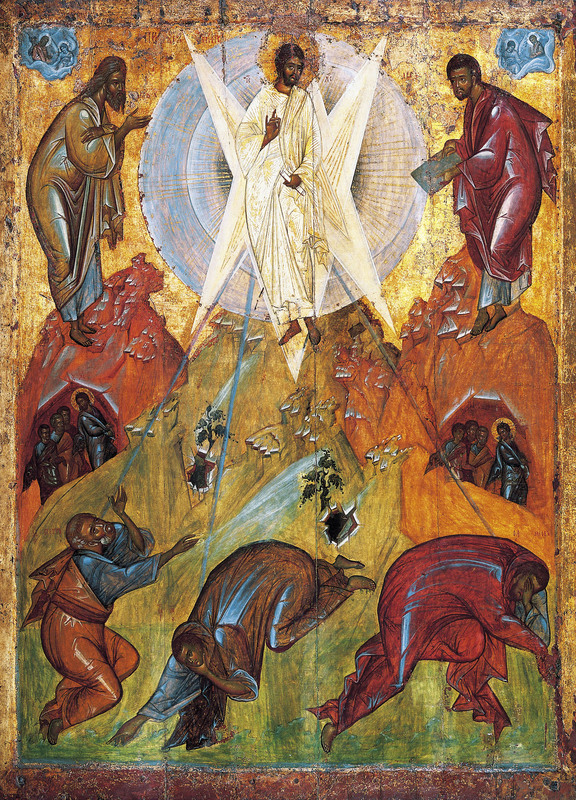 The very fact that in the Transfiguration on Mount Tabor, Christ’s human, material and bodily form was made visible in a transformed or transfigured way, that radiated the Divine Glory, is the very prototype for icons, which portray the divine glory and radiance of the Kingdom of Heaven already encountered as a foretaste, discernible while yet on earth, or as “windows into heaven,” (as icons are frequently described). The transfigured style of Orthodox icons, using material substances such as paint and wood, also affirm and validate that God truly incarnated Himself in the material world as Jesus the Christ, and that He truly rose from the dead, restoring with Himself all creation to the glory and goodness in which He originally created it. The fact that Western Christianity does not have icons (and indeed, largely rejected the decisions of the 7th Ecumenical Council in 787 affirming the use of icons), is clear evidence of the rejection of the theological basis of icons. A fundamental question that all human beings must deal with in some way is — what is the nature of our physical bodies and how do they relate to our souls and to the rest of the world? Are our bodies and the material world good or evil? Traditional Western Christian thought has had a lot of trouble accepting that the material world is good, and both in Medieval Catholic thought and in Protestant Reformation thought, life was viewed as an antagonistic war between the “good” immaterial world and the “depraved” body and material world. And sometimes, as in much of Protestant Reformation thought, the entire human being and human nature were viewed as hopelessly depraved, along with the body and the material world around it. There is no room at all for icons in such a world-view. In contrast, Orthodoxy vigorously maintains that the material world is good, not only because God created it and said it is good, but that God, the Invisible and Non-material, Incarnated in the material world as Jesus the Christ, the Word of God, the Second Person of the Holy Trinity. Eastern Orthodoxy maintains that the material world fell along with mankind, but that it is meant to be restored to its original glorified state, along with human beings. That this is possible and will occur is validated and confirmed by the vision of Christ’s Body and the entire surrounding nature being transformed and revealed in Divine Glory at the Transfiguration of Christ. Theophanes the Greek’s icon of the Transfiguration (shown above) depicts the Glory around Christ better than any other iconographer has done. Thus we see that the nature of what it is to be human is also revealed in the Transfiguration of Christ. Instead of human nature being hopelessly depraved, as most Protestant Reformers believed, Orthodoxy maintains that human nature is basically good, because God created us in His own Image (the Greek word, eikon means ‘image’), and took on that very image when incarnating as a human being, and furthermore revealed its glory in the Transfiguration. Thus, we see Christ Himself revealing in His Transfiguration that human nature is an icon of God that is tarnished because it is fallen, but like a badly tarnished silver bowl, by scrubbing and rubbing, it can be restored to its original divine glory. Therefore, the Transfiguration not only reveals Jesus’ true Divine Glory, but shows to us the potential of human nature when restored to its original glorious state. All Christians speak of seeking salvation and having the desire to “be saved,” but differ enormously in defining what the nature of salvation is and how Christ achieved that salvation for us. In Western Christian thought, salvation tends to be pictured mostly in terms of NOT going to hell, but in going to heaven, and this is largely seen as having been achieved by Christ by means of His “paying off” a cruel, merciless God by His own suffering and death on the cross for our sakes, redeeming or ransoming us from death and eternal suffering, which are the consequences of our sins. In contrast, for Orthodox, it is more the Transfiguration than the Passion and suffering of Christ that reveals to us what our salvation is all about. For Orthodoxy, salvation is ultimately the sharing and participating in the glory of Christ’s Transfiguration, which is a prelude to the victory of His glorious Resurrection. Salvation and Atonement are viewed as the restoration of the glorious divine character of human nature, achieved by Christ’s victory over the power of death and evil, not as a “paying off” a debt to a mean, vindictive, merciless God, Who needed to have His own Son be tortured and crucified to “ransom” sinful mankind. All this leads us to recognizing that the end purpose and goal of earthly life is the restoration and transfiguration of the entire world — both material and spiritual — as it was in the beginning when God created it. This is precisely the vision of life in God’s divine Kingdom as depicted in authentic Orthodox icons. What is a vital and essential principle for Orthodoxy, and which is totally absent in Western Christianity, is the belief that the material world is essentially good, not evil, but that it also fell when mankind fell; likewise, it will also be restored and participate in sanctification when mankind is restored to the transfigured life. The Transfiguration of Christ proclaims, confirms and validates this essential Orthodox spiritual Truth. Orthodox spiritual life is essentially spiritual warfare, whose goal is transforming our fallen human nature and restoring it to its original state as God created it. Another way of describing this is that we seek to scrub, polish and shine up our tarnished human nature, like a badly tarnished silver bowl, restoring its original glory as was manifested in Christ’s Transfiguration. The means by which we strive to achieve this goal, as we synergistically cooperate with God’s grace, is by spiritual ascetic practices that include prayer, worship, repentance, confession, fasting, alms-giving and abstaining from sin; reading the Bible and other spiritual reading; by receiving the Holy Mysteries of Christ’s Body and Blood in Holy Communion; constantly seeking to be united with Christ and having Him live in our hearts; by practicing being continually in God’s Presence; practicing continual prayer; and striving to live a fully God-centered humble life. By daily practicing these spiritual exercises, we thereby strive to overcome our self-centeredness. (Other ways of expressing the same process are: being crucified with Christ, carrying our crosses, dying to ourselves, overcoming our egos, sanctification, acquiring the Holy Spirit, acquiring humility.) By daily practicing these things, we can become increasingly more like God. This is the most important, significant basic principle of Orthodox spirituality, which is called deification (coming from the Latin word for God), or theosis (the equivalent in Greek, coming from the Greek word for God). This means that we can become like God by grace, what God is by Nature. It is the meaning of the profound Orthodox assertion that “God became man, so that man might become God,” or “like-God,” (a statement attributed to both St. Irenaeus of Lyons and St. Athanasius of Alexandria). That humans have the potential to be deified and participate in the glory of Christ’s Transfiguration is a fundamental Orthodox principle that is in radical opposition to Catholic and Protestant theology. This is precisely why Protestants totally disregard the Transfiguration as a feast, and why Catholics only give the feast a passing glance as a biblical event in Christ’s life. We basically have now gone full circle, and we can more-or-less summarize the theology of icons, the nature of the material world and human nature, salvation, the end goal of creation, the spiritual life, and the theology of Who Jesus Christ is — that they are all proclaimed and affirmed in Christ’s glorious Transfiguration. This is the one and only time during His earthly life that Jesus’ Divinity was fully revealed and made manifest. His entire Body was bathed in Divine Glory affirming that He is both fully God and fully Man — the ‘God-Man.’ This Theophany on Mount Tabor also foreshadowed the Glory of Christ’s Resurrection and Ascension that were to follow shortly, and thus the fulfillment of the very purpose of the Incarnation — to restore fallen humanity and all creation to their original goodness and glory as originally created by the Holy Trinity through the Logos/Word. And this is the vision of Christ’s Transfiguration, which is precisely the invisible spiritual reality made visible in authentic Orthodox icons, and apprehended by us while yet on earth. Glory to God for all Things.